These silver brogues were love at first sight and I'm not one little bit sad about the fact that the weather is rather cold and rainy for July, at least I get to wear these Hobbs beauties already now. I thought I'm going to do a series of different outfits to show you how versatile lace ups are. My first outfit choice was to pair them with ripped jeans and a pink blazer. Wirklich ein sehr cooler Look un die Schuhe sind echt toll!! Love this combination, the pink makes it different and goes perfectly with the metallic - I was looking at Boden's silver brogues but they are a bit shiny - much prefer these! Nice outfit. 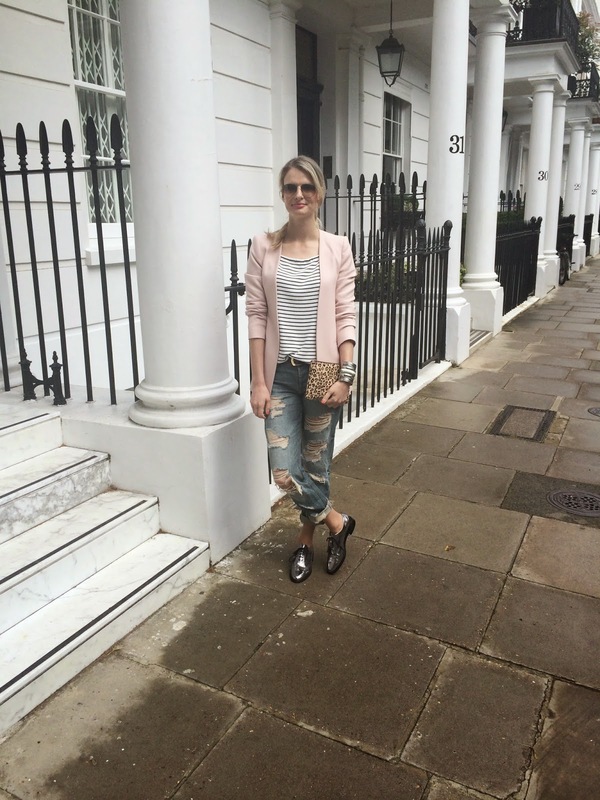 I love how you paired the girly blazer with the boyfriend jeans. Great outfit! Love your leopard clutch! Love! The striped tee, blush blazer and distressed denim are all perfect pieces together or separately.